If you have watched any of The Conjuring (2013), Annabelle (2014), or Annabelle: Creation (2017), you should have seen that creepy doll named Annabelle. 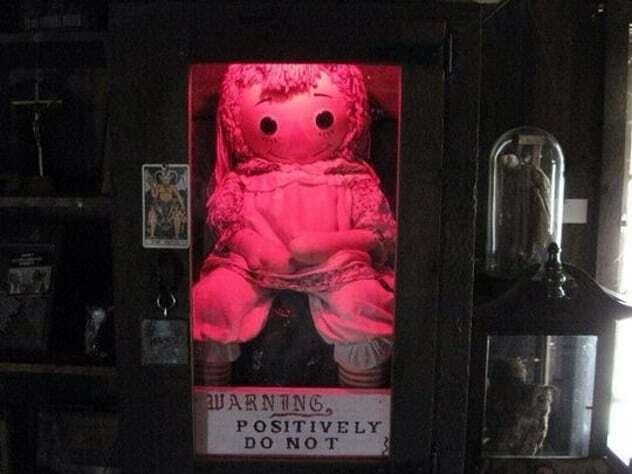 She is based on a real, but less creepy-looking, doll called Annabelle, which is on display at Ed and Lorraine Warren’s Occult Museum in Monroe, Connecticut. The story of Annabelle’s creepiness began in 1970, after a woman bought her for her daughter. People soon started accusing the doll of random attacks and even attempting to strangle a family friend. Ed and Lorraine Warren investigated the criminal activities of the doll and concluded she was possessed by an evil spirit. They decided to take Annabelle to their museum, but their car’s brakes and steering mysteriously refused to work until they sprinkled holy water on the back seat, where Annabelle sat. Ed kept the doll inside a glass box fortified with prayers. That probably didn’t stop Annabelle from committing more atrocities, though. A boy and his girlfriend once had an accident on their way home after Ed sent them out of the museum for mocking Annabelle and banging on her box.